If happiness were tangible, my happiness would take a shape of a little yorkie, my darling Wolfie, and a shape of chocolate! Nowadays, dark chocolate is well known for its health benefits. One of such benefits is that it contains substantial amount of antioxidants that reduce the formation of free radicals. Among different types of chocolate, undoubtedly, raw chocolate has the most health benefits. Ever since the raw food cooking class I attended in September, eh, 2009, I’ve wanted to try out the raw chocolate recipe I learned there. This recipe is unbelievably simple! In fact, it is just a matter of getting all the necessary ingredients. Anyway, the other day, I finally got my act together (after more than a year, I must add…) and gathered everything I need for the recipe. 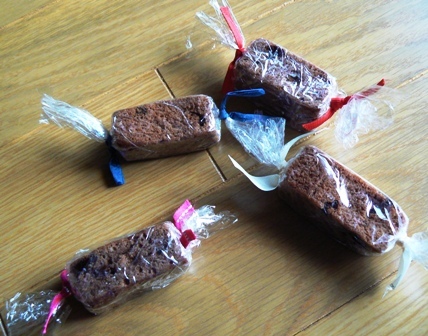 As I said, it is very easy to make and, well, it took me only 10 minutes to prepare the chocolate and a further 30 minutes or so to set it in the fridge. To fellow chocoholics, here is the recipe for you! 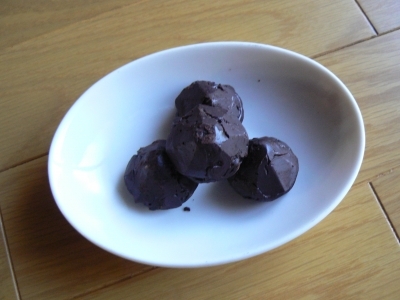 Melt cacao butter or coconut butter (oil) in a bowl over another bowl of hot water of roughly 45℃. Mix well all the ingredients together until smooth. Pour the mixture over a mould of your choice and set it in the fridge. 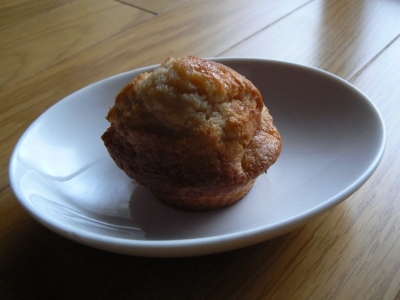 Muffins are one of the easiest treats that you can make. Basically blend together all dry ingredients in a bowl and do the same for all wet ingredients in another bowl. Then add wet mixture into dry one and stir until just combined. 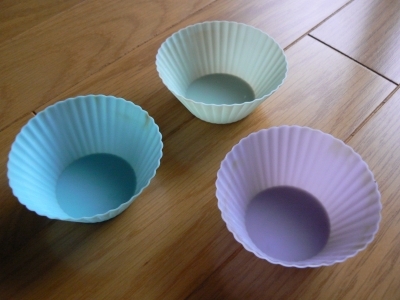 Fill cake cases and bake them until done! VERY simple and quick, huh? Just remember not to fill the cases to the top. If you do so, the batter will overflow as it rises once baked. Do use silicone bakewares, if you can. They are so convenient - no need to grease or line the cases and can be used again and again! The weekend before last, I baked two types of muffins - "Banana Walnuts & Choco Chips Muffins" and "Apple Cinnamon & Maple Syrup Muffins" - for "Make a Wish 108 Surya Namaskar Mala" event. By the way, the event was a great success! I salute to everyone who participated - well done!!! A participant of the event has asked me for the recipe, so here it is. Prepare the muffin batter as I mentioned above. Gently fold in apples before fill each case and bake for about 20 minutes, or until muffins are golden and a skewer inserted in centre of one comes out clean. Remove muffins from oven, prick holes in top of each muffin using a skewer. Pour a teaspoonful of maple syrup over each one when still hot. Enjoy the moist & scrumptious muffins! On a cold day like today, my old ambition of moving somewhere warm resurrects itself. I know <?xml:namespace prefix = st1 ns = "urn:schemas-microsoft-com:office:smarttags" />Osaka is not that bad, some might say. The temperature rarely dips below zero and a cold spell doesn’t last for long normally. Still, the statistic does not reassure us when we are feeling really cold, does it? Anyway, to keep myself warm from inside, I’ve been experimenting on winter warming drinks. 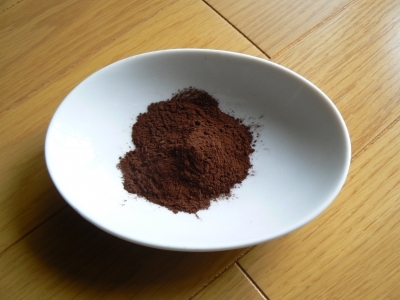 I just add warming spices such as ginger, cinnamon, cardamom and cayenne pepper to my favourite hot drink – hot chocolate! If you use spices in powder form, preparing the drink is very quick and easy. Just remember not to overpower the drink with spices. All you need is a tiny pinch of whatever spice you like. I warm up soya milk in a pan and add a little ginger powder and instant cocoa to make Ginger Hot Chocolate. 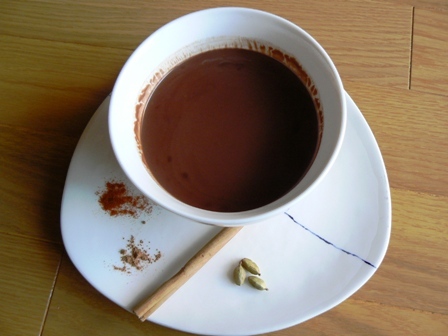 Or instead of ginger, add a little cinnamon power and cayenne pepper to make Aztec Chilli Hot Chocolate. When I have plenty of time, I make hot chocolate from scratch and, believe me, this tastes miles better! Combine all ingredients in a pan over medium heat whisking gently until the chocolate melts completely and the mixture is steaming hot. 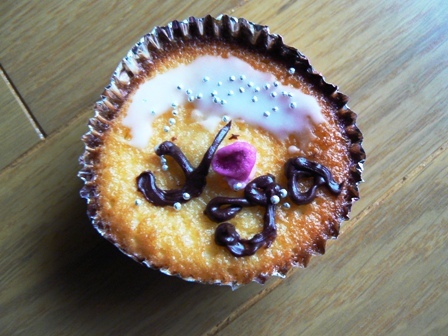 As I wrote in my last blog, we’ve been giving away homemade cupcakes and brownies to celebrate our 1st anniversary. Anyway, some people have asked me for the brownie recipe, so here it is. According to my sister, it’s very easy to make. Grease a 30 x 20 cm square cake tin and line bottom with baking parchment. Place walnuts in a plastic bag and break them into pieces using a rolling pin. Sprinkle a little rum (extra) over raisins and set aside. Place butter and brown sugar together in a pan over a low heat whisking all the time until it starts bubbling. Add dark chocolate pieces to the pan and heat further until chocolate melts and all blended well. Remove from the heat and leave it to cool slightly. Whisk eggs and sugar together in a large bowl until thick and pale in colour. Stir in walnuts, raisins, flour and chocolate mixture until blended. Pour brownie mixture to prepared tin. Bake for about 30 minutes until a skewer inserted in centre of brownie comes out clean. Brush rum over brownie while hot. Let it cool in tin completely, then remove and cut into squares. Now autumn has truly settled here and the temperature starts plummeting, I crave for brownie with steaming mug of soy latte. When I feel extravagant, I warm up brownie in microwave and serve with a scoop of Haagen-Dazs vanilla ice cream! My dad grows vegetables in his allotments and garden. At the moment, the summer vegetables such as cucumber, aubergine, okra, pepper and tomato are abundant. These vegetables are versatile and you can eat them in loads of different ways. 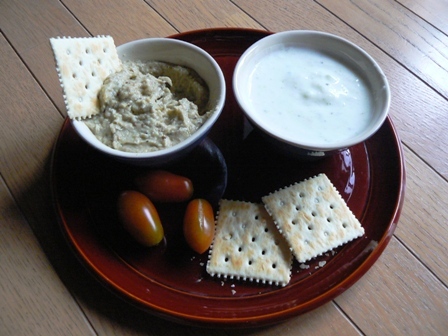 But now the heat and humidity of summer is so intense, what I crave is something cooling like homemade dips! They are fantastic for dipping raw vegetable sticks such as celery and carrots. Also spread over crackers and crispy breads will make a yummy snack. Excellent accompaniment for BBQ, too! So here are two great recipes you can try. To prepare, peel the cucumber and then grate it on a medium-coarse grater. Wrapping it in a clean tea towel and squeeze out as much moisture from the cucumber as possible. 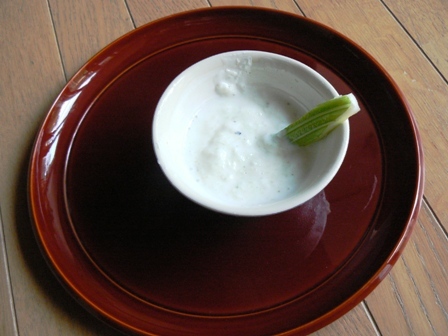 Place the cucumber in a bowl, add the crushed garlic, salt, yoghurt and wine vinegar and mix well. To prepare, preheat the oven to 200℃ or the grill to hot. Prick the aubergines and bake them for 40 minutes or until soft right through or alternatively put them under the hot grill turning frequently. Allow them to cool a little, then halve them and scoop their flesh if baked or peel the skin if grilled. 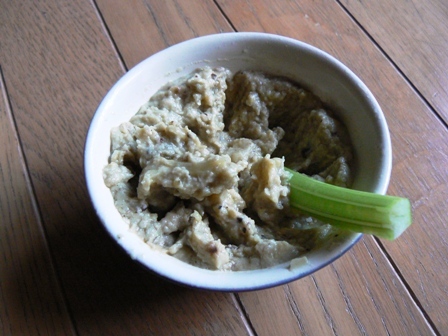 Put them into a blender or food processor and add the remaining ingredients and blend until you have a puree.